Improvements have been significant in controlling the avian flu virus, but governments need to urgently tackle the factors allowing animal diseases to travel across borders to stop new contagions, according to top officials. Representatives from 32 countries have been meeting since 26 March in Bangkok at the biennial Food and Agriculture Organization (FAO) conference for Asia and the Pacific to consider issues such as food security. A key discussion was the growing threat of transboundary animal diseases, which have gained prominence because of emerging zoonotic diseases - which can be transmitted from animals to humans - such as avian influenza. “Over the past 10 years, disease outbreaks have affected millions of poor households dependent on livestock for livelihood and food security; [their] occurrence is now considered an emergency,” Carolyn Benigno, animal health officer with the FAO’s Regional Office for Asia and the Pacific, told the conference. “The emergency nature of animal disease control stems from the fact that 75 percent of infectious agents known to be emerging in human populations are deemed zoonotic,” said Benigno. Benigno’s presentation was based on an FAO report to the conference outlining the long-term threat to human populations and food security from transboundary animal diseases. Foot-and-mouth disease, classic swine fever and haemorrhagic septicaemia are among the “priority diseases” in Asia, while avian influenza remains a threat, according to the report. households dependent on livestock for livelihood and food security. “Enhanced surveillance, detection and response in several countries where outbreaks decreased or were eliminated have led to improvements but 11 countries are continuing to experience active infections,” it says. The report goes beyond the apparent causes of animal diseases to look at a complex interplay of environmental factors behind their spread. A major trend identified is the increasing demand for meat in the region, fuelled by growing incomes, changing consumption patterns and demographic changes, the report says. This demand is boosting production, and the legal and illegal trade of livestock and livestock products across borders, while increasing the risk of spreading disease. Delegates echoed the FAO report in urging greater regional collaboration in fighting transboundary animal diseases, with some calling for common policies across countries to tackle the issue. “There is still a lack of effective control of domestic animal movement, as well as cross-border control in many countries in Asia,” said Thailand’s delegate, Yukol Limleamthong. “Regulation of animal movement control must be strictly enforced and practical. As for animal movement across countries, animal movement control regulations [on] both sides should be harmonised,” he said. 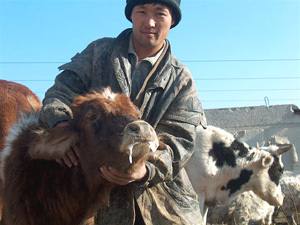 A farm worker with a foot-and-mouth infected cow, Uzbekistan, 15 December 2003. The southern and eastern provinces have suffered an outbreak of the disease. “It has to be realised that [these] particular [diseases] cannot be eliminated by unilateral effort, particularly in the region where it is happening now,” added India’s delegate, SK Bandyopadhyay. The FAO report also asks countries to commit financial and human resources to combat disease and to develop national outbreak response plans. The avian influenza outbreak in Southeast Asia in late 2003 and early 2004 pushed many governments in the region to introduce plans to deal with outbreaks. However, the same principles have yet to be applied to tackle other disease outbreaks, Benigno told IRIN, adding that the strategies used to contain avian influenza could be applied more broadly. “When there’s an outbreak, the same principle that you apply for avian influenza can be applied for this disease or an unknown disease,” she said. The conference, which ends on 31 March, also discussed food prices after they spiked in 2007 and 2008, with fears the global financial crisis would impose a credit squeeze on farmers and countries’ agricultural sectors. Delegates debated the impact of climate change on food security and agricultural production, and the problem of water scarcity.